I’m participating in the Oh My Word!! Design Team Scavenger Hunt for OMW Members! & I have a “key word” that I will be posting today & the members will need to find all the key words on the all participating Designers blogs and then unscramble the sentence. My keyword is rocks. I find that word totally appropriate for how I feel about UStamp with Dawn & friends… It Totally Rocks! I can’t wait to see who will win the fabulous hand stamped prizes!! I just love Sale-a-bration! Stampin’ Up has such great product offerings this year. I have thoroughly enjoyed using the many stamp sets, papers and embellishments. Today’s project is a card I made for my Stamp Club this week. It features the Punch Bunch Stamp Set, Happy for You Stamp Set and the Ice Cream Parlor DSP. 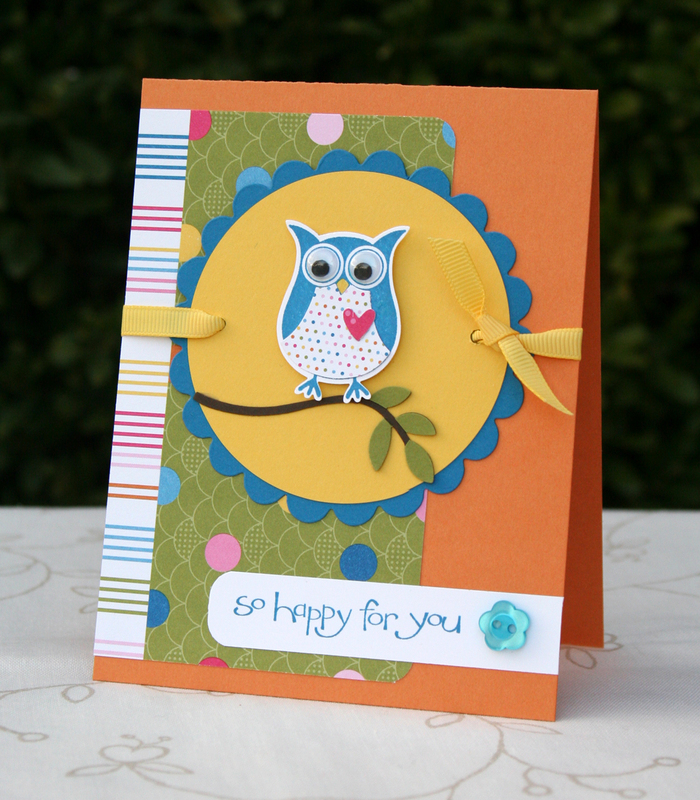 Everything coordinates so nicely together to make a fun, cheery card. So adorable! I love all the bright colours! This is such a cute and cheery card. Card is really cute. I like your ribbon treatment.